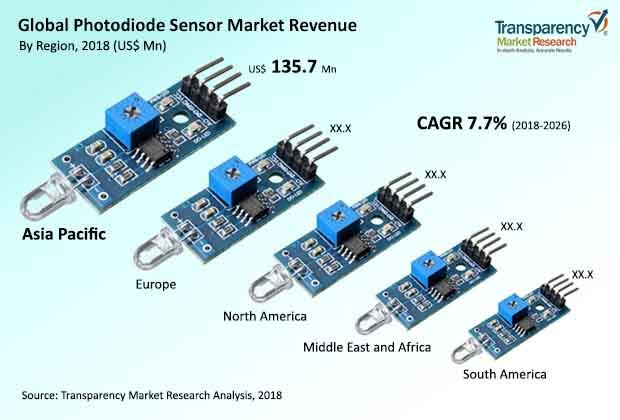 According to a latest market report titled “Photodiode Sensors Market”, published by Transparency Market Research, the global photodiode sensors market is expected to reach value of US$ 867.7 Mn by 2026, expanding at a CAGR of 7.7% from 2018 to 2026. According to the research study, Asia Pacific held approximately 28.2% share of the global market in 2017. This is primarily due to expansion of fiber optic communication in the region. Furthermore, rising penetration of the hyperspectral technology over a wide range of applications is anticipated to drive the global photodiode sensors market during the forecast period. Increasing demand for optical sensors in medical products and in the automation sector in several developing countries and rising trend of using handheld devices such as tablets and smartphones are augmenting the global photodiode sensors market. Furthermore, there has been increasing adoption of wearable technology, especially in remote health monitoring and industrial applications. Photodiode sensors have unique features such as integrated functionality, improved performance, high reliability, and high speed of response. Also, growing use of automation in day-to-day life provides new growth opportunities to the photodiodes sensors market. The global photodiode sensors market has been segmented based on photodiode type, wavelength, material, and end-use industry. Based on photodiode type, the market has been divided into PN photodiode, PIN photodiode, avalanche photodiode, and Schottky photodiode. The PIN photodiode segment has been sub-categorized into silicon, germanium, and others. According to TMR analysis, in terms of revenue, the avalanche photodiode (APD) segment held the maximum market share and is estimated to expand at a CAGR of 7.8% between 2018 and 2026. APD sensors are used widely due to their performance advantages (high sensitivity) in applications such as data transmission, distance measurement, range finding, high-speed industrial inspection (including color measurement) and in various other medical and scientific instrumentations. Based on wavelength, the global photodiode sensors market has been classified into ultra violet (UV) spectrum, visible spectrum, near infrared (NIR) spectrum, and infrared (IR) spectrum. Among these, the infrared spectrum segment holds the largest market share and is anticipated to register a growth rate of 7.8% during the forecast period. In terms of material, the global photodiode sensors market has been segmented into silicon (Si), germanium (Ge), gallium phosphide (GaP), indium gallium arsenide (InGaAs), and others. According to a research study, due to high-speed response, high sensitivity, and low noise, the silicon segment holds the maximum market share, followed by the InGaAs segment. It is anticipated to expand at a CAGR of 7.7% during the forecast period. Based on end-use industry, the global photodiode sensors market has been divided into telecommunication, health care, consumer electronics, aerospace & defense, and others (such as research, automotive). The telecommunication segment is anticipated to hold a significant market share, as photodiode sensors are widely used in optical communication systems and optical remote controls. The consumer electronics segment accounts for a major market share. It is projected to expand at a CAGR of 7.8% during the forecast period. Geographically, the market has been divided into North America, Europe, Asia Pacific, Middle East & Africa, and South America. According to TMR analysis, Asia Pacific currently dominates the global photodiode sensors market, followed by Europe. Moreover, the market in Asia Pacific is projected to witness growth at a rapid rate during the forecast period, due to increasing use of handheld devices such as tablets and smartphones and wearable devices in developing economies in the region. The markets in MEA and South America are estimated to witness growth at a sluggish pace from 2018 to 2026. The research study includes profiles of leading companies operating in the global photodiode sensors market. Market players have been profiled in terms of attributes such as company overview, financial overview, business strategies, recent developments, and SWOT analysis. Some of the key players operating in the global market are First-sensor AG, Excelitas Technologies Corp, Hamamatsu Photonics Deutschland, Kyosemi Corporation, OSI optoelectronics, Edmund Optics, Quantum Devices, Rohm Semiconductor, Thorlabs, Inc., Everlight, and ON Semiconductor. The market leaders are adopting innovative business strategies. Also, companies are developing strategic relations with different industries to expand their portfolio of photodiode sensors, offering application-specific, standard, and custom photodiodes and also, to enhance their presence in the market in different regions worldwide.